Once upon a time in the hundred acre wood, the classic characters we all know and love needed a new look for their very own set of iMessage stickers. In anticipation of the new Christopher Robin movie, Disney approached us to create of set of stickers in line with the stuffed animal character designs of the movie. We drew inspiration from children’s books and developed a style that resembled cut paper with distinct texture shading. 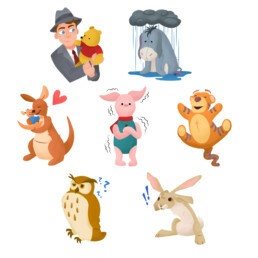 We then illustrated all nine characters that were going to be in the sticker pack: Christopher Robin, Winnie the Pooh, Tigger, Piglet, Eeyore, Rabbit, Owl, Kanga and Roo. 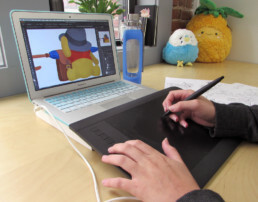 This tested the style’s flexibility in rendering human characters, stuffed animals, and realistic computer generated animals. 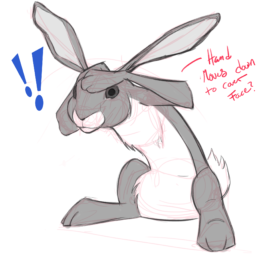 Once style direction was determined, the next step was sketching out all the stickers. Upon sketch approval, all stickers were colored and textured. The art was then sent over to our animation team. Many were animated in After Effects but a few required special attention. Those got frame by frame treatment. Rough animation was completed to get direction approval before final rendering. It was pleasure to work with the team at Disney and an honor to work on characters we all adore. The team looks forward to seeing the movie this Friday, August 3rd! Check out the full sticker pack and download for your iPhone!